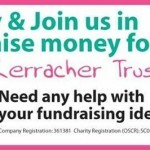 The Katie McKerracher Trust is promoting a fund-raising event for the Trust throughout the month of June. The idea is to encourage people to hold their own small event using a themed pack from the Trust whenever it suits them during June and it’s really taking off! People are holding bbqs, Common Riding breakfasts, tea parties, coffee mornings, dinner parties, whatever you feel comfortable doing with as few or as many people as you want to have, let us know numbers and you can order napkins, balloons, home-baking labels, stickers and donation envelopes along with Trust leaflets and our latest newsletter. All you ask of your guests is to give a donation for your efforts. It’s simple and a great way to enable us to continue to help families in a wide variety of ways. If you can help and want more information phone Ann McKerracher on 01750 52387 or email info@katiemckerrachertrust.co.uk.